I wish to thank them very much. I will post about the loaf cake pan in another post with a recipe I have already made so today the post will be about the ice pops. 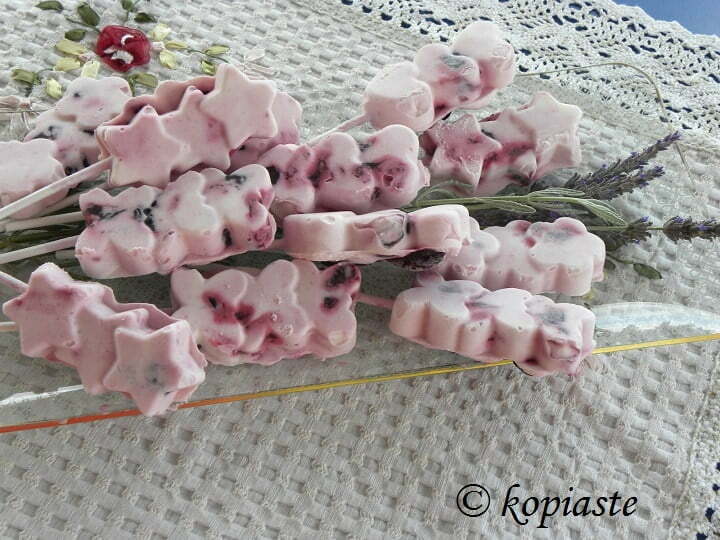 There are 12 moulds in the kit as well as 50 sticks and a recipe leaflet with recipes. You can make ice pops with ice cream , sorbet, granita or smoothies mixtures. I make 90% of my recipes by improvising with ingredients I already have at home. Last Wednesday, we bought lots of fruit from the farmers’ market: watermelon, melon, peaches, nectarines, apricots and cherries. However, how many fruit can two persons eat? The watermelon was cut in a 1/4th slice (around 2 kilos) and was the first to be consumed. We kept the melon to be eaten last and the remaining fruit were eaten on a daily basis. The cherries are the most perishable so after 2 – 3 days if non consumed they start to spoil so if there are any leftover I usually cook them before they do. They were about to spoil when I decided to make the ice pops so I decided to make a light cherry compote, which I flavoured with lavender. I used a little bit of honey for the flavour and added stevia so that they had less calories. We have some lavender in our garden(everything is organic) and this year I picked some to dry a couple of weeks ago. After asking my friends on Facebook, if they wash the lavender before drying it, most of them said they do not wash it. As this year we had a lot of rain and some times it was raining dust from Africa, I decided to wash it. I left it in a colander overnight to drain and the next day I wrapped it in a tulle because I don’t want flies or other insects to touch it, and hang it in doors (never in the sun) to dry. I believe it’s going to take a while until it dries as a week later when I tested it to see if it crumbled, when I tested it with my two fingers, it was not dry yet. This of course always depends on the climate conditions. The climate here in Assini, is rather humid, especially during the mornings, so in other places it may take less time to dry. Since my lavender had not dried, I used some of the fresh lavender I left on the plant. I used three flowers which I inserted in disposable tea bags. Although they are disposable, if you wash them you can use them multiple times as they are quite durable. I used this lavender to flavour the cherry compote I was making. I wanted this cherry compote to be low in calories, so I just added some honey, for the taste and flavour and sweetened the syrup with stevia. If you are diabetic it is advisable not to add any honey, unless you consult your doctor first. What I made was something between an ice cream and frozen yoghurt. While the compote was cooling, I whipped the heavy cream which I stored in the fridge and all I did was to add the yoghurt to the cream and mix in part of the compote. The quantity I made was enough for over 24 ice pops. I made 12 and in the leftover cream I mixed more compote in (about 1 cup) and made an easy dessert. If you want to make more ice pops, you can leave the cream in the fridge until the next day and make more. When the first batch is ready, after removing them from the molds, you can wrap each one in cling film and put them all in a freezer bag. Whenever you crave for something sweet, one of these ice pops is refreshing, delicious, healthy, with no preservatives or additives, without any artificial colour or aroma and with only 64 calories each. Put the cherries in a deep frying pan or pot, add the honey and the tea bag and cook for five minutes from the time it starts boiling. Set aside to cool. Whip the cream until peaks form and mix in the yoghurt. Refrigerate until ready to use. Add 1 cup of cherries and mix. Fill the ice pops with cream and cherries and then add the stick, at least 3 – 4 cm inside the cream. Add more cherries on top. Refrigerate for a few hours until they set. What better than an ice tea to quench your thirst during the hot summer months! So, when I finished with the cherry compote, I used the leftover lavender tea bag which was soaked with cherry syrup to make ice tea, combining it with raspberry tea leaves. *If you want the iced tea to be sweet you can add 1 stevia disc in the hot water or if you don’t mind the calories you can add more syrup, honey or sugar. Bring the water to a boil to 100ο C and put the raspberry tea leaves in another disposable tea bag or in a tea infuser in the hot water. Add the used lavender tea bag and let them infuse for five minutes. Remove the tea bag and infuser. Add the syrup and lemon juice, stir and let it cool. Serve with ice some cubes and a lemon slice. Today’s even is hosted by Simona Carini, of Briciole, who will be our host for the letter M as in Minneapolis (United States). I love greek yogurt and the lavender in these recipes really adds a nice touch! They look adorable! Thank you for contributing to the USA stop of the Abbecedario. Lavender! What an excellent idea that is! I’ve never thought to add lavender to yogurt but will be trying it out now 🙂 Thanks!